I really am trying to catch up so that I’m not writing these things months after I’ve actually read them! It’s very hard to recapture one’s feelings upon finishing a book, but I’ll give it a shot. 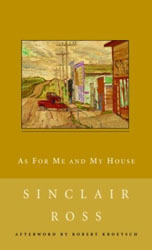 I did enjoy this book, especially its evocation of the prairies — and the small prairie town — during the Great Depression. In fact, the landscape is the only ‘character’ of the book that is unambiguous and stark in its reality. But even in that there is a possibility that the reader is being shown a facade (just like the “false-fronted towns” Mrs Bentley refers to); after all, the town is called Horizon — a place that can never be reached no matter how far one travels. There’s just so much to think about and discuss with this novel: how reliable is Mrs Bentley’s narration? is she or is Philip the main character? what is going on in the weeks that are omitted? There’s the role that art plays in the novel, the lost son, the replacement son in Steve, and the half-son Philip at the end of the book. There’s the theme of religion and lack of religious feeling. And a lot of hypocrisy on many levels to analyse. It’s a very short book and the whole thing takes place in only about a year, but there’s so much crammed in here. An excellent book by Sinclair Ross.